HESCO earth-filled MILTM units can be used for perimeter protection, border control and temporary accommodation bunkers. The Concertainer® MIL unit is a multi-cellular barrier system manufactured from welded Zinc-Aluminium coated steel mesh and lined with heavy-duty non-woven polypropylene geotextile. 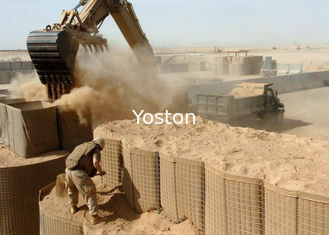 The unique design, strength and versatility enable corners to be constructed easily, shaping the defensive barrier to the surrounding landscape and when joined and filled, the system can be used to create barriers of exceptional strength and structural integrity. Whether used as a preventative barrier or to define boundaries, HESCO MIL units have been employed to safeguard personnel, vehicles, equipment, facilities and critical assets in a variety of military, peacekeeping, humanitarian and civilian operations. Recoverable MIL units are deployed in exactly the same way as our standard products, with the removal of one pin allowing fill material to flow freely from the cell. The units can be recovered fully intact and can be flat packed for transportation to a disposal site. HESCO Accommodation Bunker (HAB) is our solution to the ever-increasing threat to deployed personnel from indirect fire weapons. The bunker is designed to provide safe living accommodation for up to eight people. Ideal for sheltering and safeguarding displaced citizens in conflict zones or temporary shelter for those affected by natural disasters. Easy to build with simple tools and in-service light earthmoving equipment, two bunkers can be built in two days and can be fitted out for air conditioning, heating and other services by using the factory formed aperture built into the structure. Side walls are made of specifically developed Concertainer units, offering combat-proven protection. A lightweight aluminium roof with pre-detonation screen provides overhead protection and waterproof cover, with integral doors. HAB 2 allows the use of an optional high-quality lining kit, which provides a hygienic interior for medical use in the field. Side walls are made of specifically developed Concertainer units, offering proven protection from weapons systems up to and including large mortar rounds. A specifically engineered lightweight aluminium roof with pre-detonation screen provides overhead protection and waterproof cover with integral doors. This lightweight roof specifically designed to provide protection against indirect fire. The roof can be built on almost any wall capable of taking the load that the roof will impose upon it. 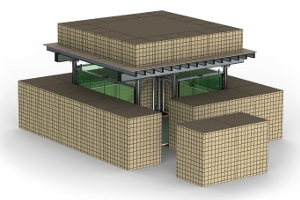 LWBR has a number of uses as the roof can create collective protection and living accommodation between walls, or overhead cover from ammunition and explosive attacks. LWBR has a maximum span of 3.3m and can be built by four men in approximately five hours. 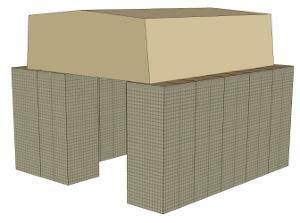 The HESCO Guard Post kit allows assembly of a small emplacement with two-foot thick walls and 18” (0.48m) of overhead cover. 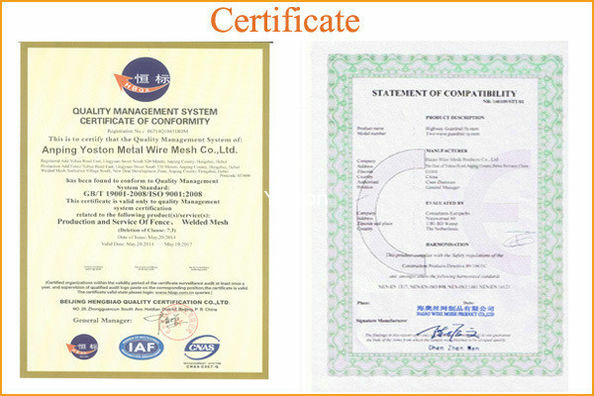 Observation point forms are included in the set as are roof joists and roofing material. 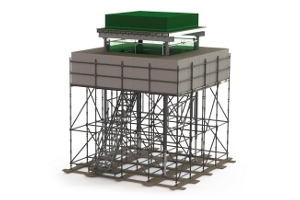 The Ground Mounted and Elevated Sangars are modular fortification comprising of HESCO protective units and HARSCO extruded alloy components. The sangar occupant is offered protection from both blast and ballistic threats with the use of HESCO® units provided.